From the back cover: "Set in Emperor Haile Selassie's Ethiopia and the racially charged world of Thatcher's London, this is a richly detailed portrayal of one woman's search for love and belonging. Lilly, born to British parents, eventually finds herself living as a devout, young, white Muslim woman in the ancient walled city of Harar in the years leading up to the deposition of the emperor. She is drawn to an idealistic young doctor, Aziz, but their love has only just begun to fulfil its promise when the convulsions of a new order wrench them apart, sending Lilly to an England she has never seen, and Aziz into the darkness of a radical revolution." This was such a good book and I highly recommend it. It gave me so much insight into the lives of refugees from Ethiopia and it showed how resilient the human spirit is. This book is now on its way to bartonz by surface mail. Enjoy! What a brilliant story. I was often weeping at the twists and turns. This arrived while I was at TLA (Texas Library Association). I started it last night, as soon as I opened the package! Lilly’s parents, British citizens, lead a life of reckless wanderings. While the family is traveling in Ethiopia, Lilly’s parents are killed and Lilly is sent to stay with the Great Abdal, a teacher and leader of his people. She is taught to be a devout Muslim by Abdal and she learns much about literature and art by visits from a great teacher, Muhammed Bruce. Eventually she is sent to live with a young mother, Nouria. Lilly finds she can supplement the income of Nouria and her children by teaching the children the Koran. Lilly comes to know a handsome doctor, Aziz. As Lilly grows older, she and Aziz become friends and then fall in love. The story brought together so many unexpected elements---a young British girl who becomes an ardent Muslim…a devout Muslim who risks it all for the sake of being with the man she loves…the complex ancestry of the doctor, with both desirable and undesirable parents---that it felt like a memoir. It has left me thinking about cultural identity and religious belief; thinking about a book even after finishing it is always a sign to me of an excellent read. Arrived yesterday. It looks like it's going to be an interesting read. Thanks debnance. and loveamystery. What an interesting read, Lilly of white European parents living as a Moslem in Ethiopea and then as a refugee in London. She looks European but was raised in Africa so thinks as a Moslem, while the Ethiopeans treat her as a foreigner. What suffering the people of Ethipoia have gone through, drought and political turmoil while Lilly relentless searches for her true love. Mailed this to Starrdust in Canada today. Picked this book up from the Post Office today and it has arrived safe & sound. Thanks for your note and bookmark as well, bibliotreker! Perfect timing, as I am on the last pages of my current book, so I'll be able to start reading this one on the weekend. 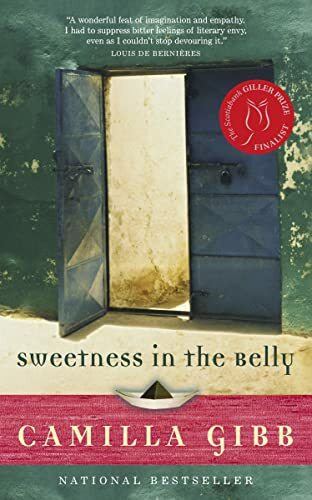 I'm so very glad to have been a part of the bookring for 'Sweetness In The Belly'. It is a beautifully written novel that drew me into the life and heart of Lilly from her early days as a young child surviving the loss of her parents, both emotionally & physically, to her coming of age in Ethiopia and returning to her roots in England...the unique perspective of a white Muslim woman and through her eyes the story of life's joys, sorrows, hopes, anguished loss, politics and basic human caring of the heart shine through. Thank you so much for including me in this bookring, loveamystery - - a Canadian book and Giller Prize Finalist. Yeh! My book arrived home safely and in good shape too. Thank you to everyone who participated. This book is now on its way to supertalya, who chose it from the Two Worlds Virtual Bookbox. Enjoy! Thanks so much! I am looking forward to reading it.